Don't miss this classic center hall Colonial with open circular floor plan, gracious entry and staircase. You will find beautiful hardwood floors & extensive mill work throughout. Thoughtfully expanded with custom kitchen and family room that includes impressive stone fireplace and built-ins. The addition was featured in St Louis Homes & Lifestyles when it was completed. This is just a fabulous space!!! Breakfast room overlooks the wonderful park-like yard. Covered side entry with portico plus mudroom, is another great feature. 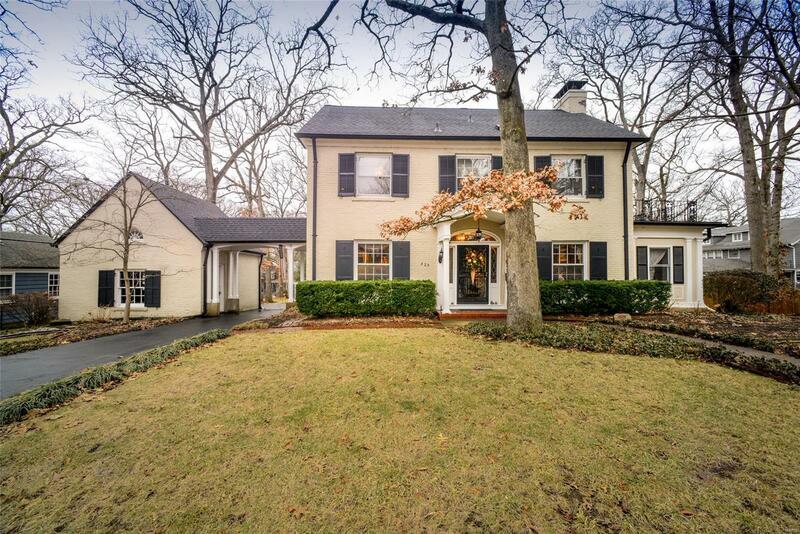 There is so much tremendous architectural detail in this meticulously maintained home! You will find leaded windows, archways, French doors, wainscoting & numerous built-ins. Roof was replaced in 2018. Zoned HVAC systems updated in 2015. The private Master suite boasts updated 16x8 bath and generous walk-in-closet. The charming screened in porch and patio are ideal for entertaining! Convenient circle drive! Outstanding location! Walk to downtown Webster!! !